There has been a lot of interest within the scientific and policy communities in the ‘resource curse’; that is, the tendency of mineral rich economies to turn into development failures. Yet, after more than 20 years of intensive research and action, ‘the curse’ still lingers as a very real global problem, because of volatile mineral prices, bad governance and conflict. 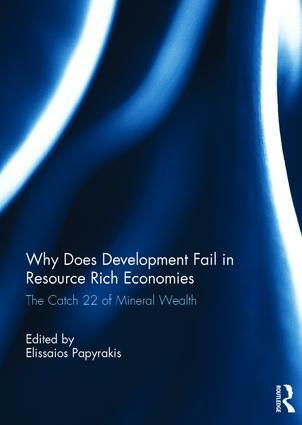 This book incorporates current original research on the resource curse (from some of the most prominent contributors to this literature), combined with a critical reflection on the current stock of knowledge. It is a unique attempt to provide a more holistic and interdisciplinary picture of the resource curse and its multi-scale effects. This edited volume reflects the current academic diversity that characterises the resource curse literature with a mix of different methodological approaches (both quantitative and qualitative analyses) and a diverse geographical focus (Latin America, Sub-Saharan Africa, global). Taken together the studies emphasize the complexities and conditionalities of the ‘curse’ – its presence/intensity being largely context-specific, depending on the type of resources, socio-political institutions and linkages with the rest of the economy and society. This book was originally published as a special issue of the Journal of Development Studies. Elissaios Papyrakis is Senior Lecturer in Economics at the International Institute of Social Studies, Erasmus University Rotterdam, The Netherlands and in the School of International Development, the University of East Anglia, UK. His work lies at the intersection of environment and development issues.